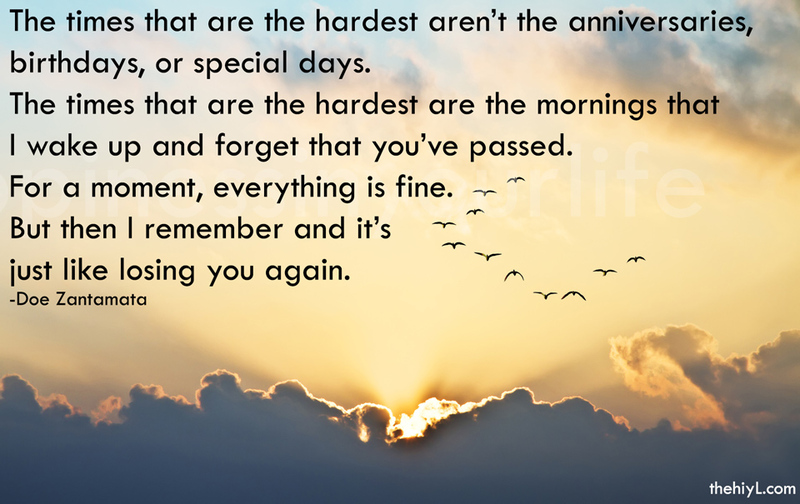 The times that are the hardest aren’t the anniversaries, birthdays, or special days. 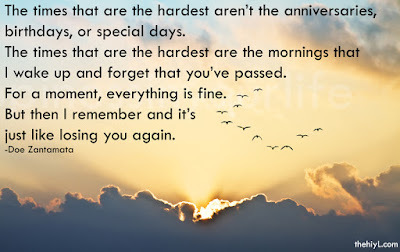 The times that are the hardest are the mornings that I wake up and forget that you’ve passed. For a moment, everything is fine. But then I remember and it’s just like losing you again. As time passes, the pain will lessen. It won't go away entirely, but it won't hurt nearly as much as it does now. The pain will slowly be replaced by gratitude, pure and bittersweet. You'll get through those special days and instead of dreading them, you'll just wish they were there, too. They would have loved that dish or to do what they used to do that everyone remembers so well. Your life has not stopped, nor would they want that for you. If you aren't able to be happy for yourself, do it for them at first. Imagine them looking at you, wanting to see your smile, wanting to see you enjoying life again. Because they do. They want it as much as you'd want it for them if you'd passed and they were still here. You'll see each other again. In dreams from time to time and then after you pass. That time seems like an eternity but it's very brief. Spend your time here keeping busy, making new memories with people who you love, learning about this world and about yourself. No person can replace another person who meant the world to you. But happiness can replace the pain that weighs down your broken heart and life can be wonderful again. Live in love and gratitude. Take care of your tender heart.